Today, publishers will restart an old comic with a new #1 issue just to boost sales. It's a far cry from the old days, when a brand-new comic book title was looked on with caution! A higher issue number told the newsstand owner that the comic had been around a while, and so was a tried and tested commodity. But a brand new comic? Why, that could be money down the drain! Best to play things safe. Yet here, just a few months after launching Fantastic Four #1, Stan & Jack launched another new comic, gambling further. Was Stan feeling cocky and confident after that first warm reception? Or was it more a matter of throwing a billion things at the wall to see what might stick? Perhaps inspired by the success of The Thing over in FF, Stan here made the monster/hero the main feature, and a classic monster mix at that: In countenance, Frankenstein's creature; in manner, Jekyll & Hyde. Something most comics fans know is that in the first issue, Hulk was not green, but gray. Well, that was the intent ... but the printing process had a bugger of a time with gray, and the Hulk ended up being various colors depending on which page he was on, including green - which Stan went with from then on. 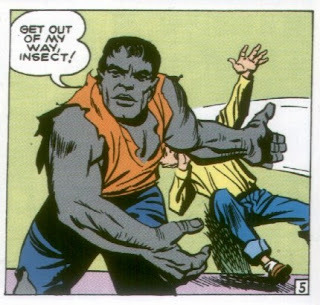 Also note that though the monster is more instinct than intellect, he's a far cry from the dumb "Hulk smash!" state he would later devolve to. And, of course, we also meet the unlikely sidekick, teenager Rick Jones. Already an orphan, his attachment to Bruce Banner is instantly cemented with the bonds of self-sacrifice and guilt, when he realizes that it was the act of Bruce saving Rick - during a stupid prank, no less - that ended up cursing Banner with his burden. If such a tale were being written today, the guilt of such a thing would probably consume Rick, turning him into a tragic figure. 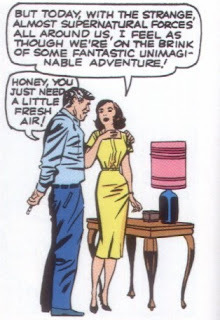 Fortunately, Stan must have realized that the monster was dark enough on his own, and needed some lightness and relief. In fact, there are some surprisingly heavy themes at work for an early '60s comic. Bruce's genius came up with the devastating gamma bomb - and was punished for it accordingly. And that's not all: Earlier, when warned of the consequences if his theories were wrong, his arrogance is staggering: "I don't make mistakes." Strangely, the last segment - in Soviet Russia - just doesn't fit. 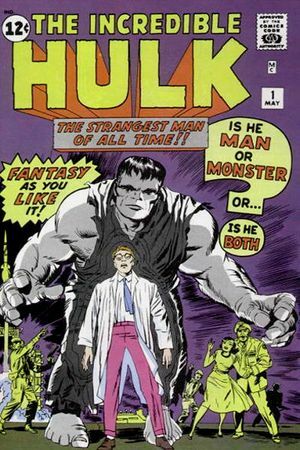 By all rights, it sounds like it should have worked: The Gargoyle reveals he once had been a brilliant scientist, one who was turned into a misshapen monster because of his government's bomb tests, and thus proves a fascinating counterpart to the Hulk - and in the very first issue, to boot. But that's part of the problem; as interesting as it is on a thematic level, it just doesn't fit in with the earlier, darker stuff. Still, it gives Stan & Jack an excuse to end a first issue with a mushroom cloud, for the second time in three months...! The Hulk looks strangely modern in the "Hulk Strikes!" picture. Looks like 80s art, maybe, though the soldiers are distinctly 1960s Marvel. 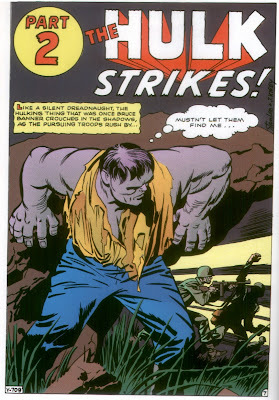 according to Stan Goldberg, who colored all the comics at the time, and had a lot of leeway (excuse the pun) to devise color schemes, the Hulk's gray color was changed in the second issue because gray did not reproduce consistently, and thus was not good on a continuing character (although they could get away with it on the shorter monster stories). Green was used because it was a color they was strong and Goldberg thought it worked well (and was not being used for other Marvel heroes, which were usually shades of red or blue). You can hear what Golberg has to say (as well as Roy Thomas, Joe Sinnott, Mark Evanier and a cameo by my pal Barry Pearl, at a Jack Kirby tribute panel that took place at a New York con a few years ago. I was there and it was fun and informative. I didn't quite like the ending on this one. I mean, why would the Gargoyle mind so much having his appearance fixed, if he was determined to die?? It just doesn't make much sense, but it's incredible how these early comics bashed the Soviets in any chance they had. Such a completely beneficial article. Very interesting to read this article. I would like to thank you for the efforts you had made for writing this amazing article. Keep it up the extremely good writing. I appropriate to your work please visit us Create Business Page Online now possible right here. Nice article. Very good info.God bless you. May you live long. Very good work. Thank you for sharing this article...Good work. God bless you.. Very nice information... Such an amazing post. Coworking spaces in Gurgaon might be the trendiest idea for an office space. The challenge is to choose an office space when we talk about office spaces in Gurgaon and Delhi . you must think of choosing a co working industry in Gurgaon, office space on rent in Gurgaon . Check there should have some provision to share an office space and parking provision where you have decided to purchase office space. What is a paper wallet ? A Paper Wallet is an offline cold storage wallet for cryptocurrencies. A paper wallet is a great way to store your money if you have nothing else on hand. This technology is what fuels Multi-signature wallet. and makes all cryptocurrencies ultra safe and secure. The Bitcoin Electrum Wallet is also capable of creating a multi-signature wallet. how to make paper wallet ? A paper wallet is make using a program which randomly generates a private and public key. A Hardware wallet supports only a limited range of cryptocurrencies. Theicoshowcase maintains the only complete ICO calendar of all active ICOs and upcoming ICOs. We keep our ICO list up to date and providing quality information about Pre ICOs, Active ICOs, Upcoming ICOs. ICO list is curated and up to date list of active, upcoming ICOs.Theicoshowcase maintains a special ICO calendar, sharing the most relevant ICO information. Gati Packers and Movers in Chandigarh offer the quality and affordable packing and moving services all over India. We are experienced packing and moving company deals with wide range of relocation/shifting services at very genuine rates. To get more details, contact our experts. Thanks For sharing post.Your blog is informative.Which is the Best Website Designing Company in Delhi NCR? Thanks for this post is very informative and interesting.all the points are very useful.Thanks for sharing such a nice post.Which is the Best SEO Company in Delhi NCR? Skratch is the best dj academy in india and it provides various courses such as CD DJ course and music production course for its students. Get your best life coach in Noida. Peyush Bhatia helps to face the challenges of your life and gives you the right path to success. Except life coaching, we also provide soft skill training, Child counselling in Noida. Gain your self-confidence again and manage your problems with journey within. Call for more details. Vashikaran specialist is like a blessing for the people. We use it for the happiness of the people who are unhappy with their life and wish to see any change. Hulk is one of my favorite character from the Marvel comics. The power hulk possess is unrivaled. Anyways, you can checkout our work at About Us to learn more!